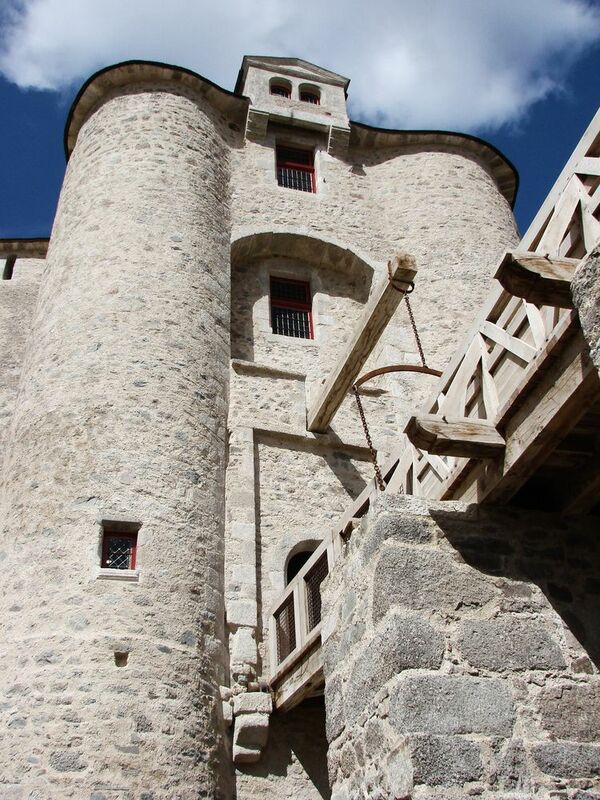 Access to the castle is via an entrance made up of a carriage door and pedestrian door. 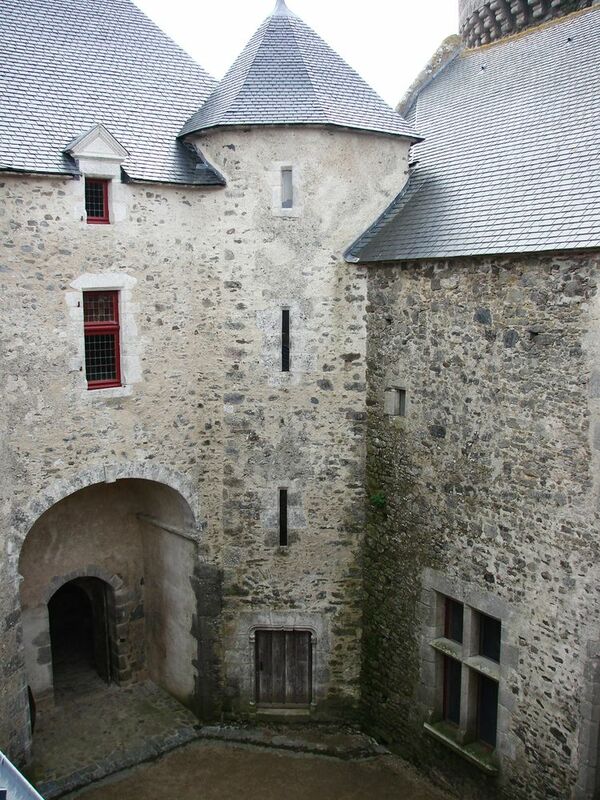 The entrance provides access to a huge court used as the outer ward, facing the inner ward inside the castle. This spacious courtyard is surrounded on three sides by farm buildings (cowsheds, barns, stables and a house), all dating from the 17th century. Opposite these farm buildings stands the medieval fortress. The two sets of buildings were separated by a moat filled with water, which surrounded the castle until the 18th century. 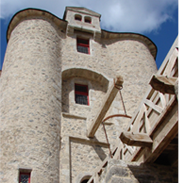 The main means of access today is via a restored drawbridge. 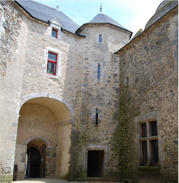 It is the main entrance door, to the East, built in the 14th century. 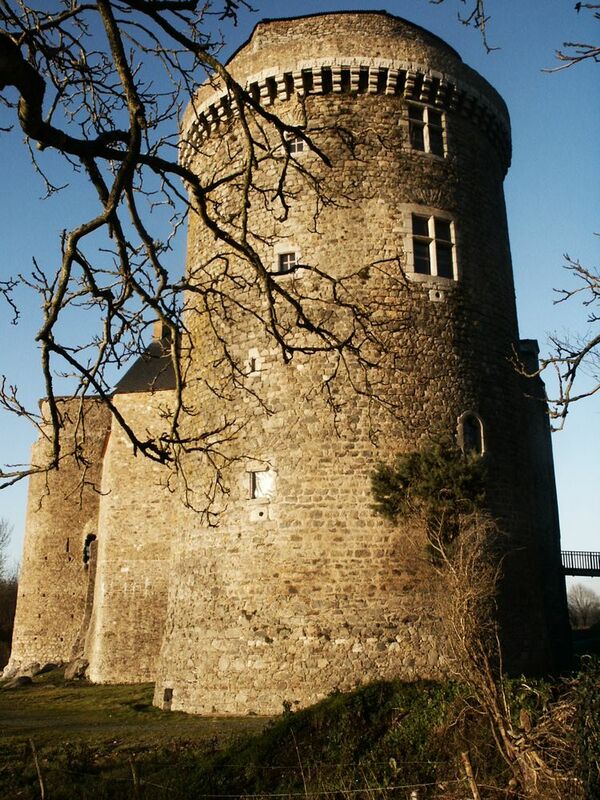 It comprises horseshoe-shaped towers. 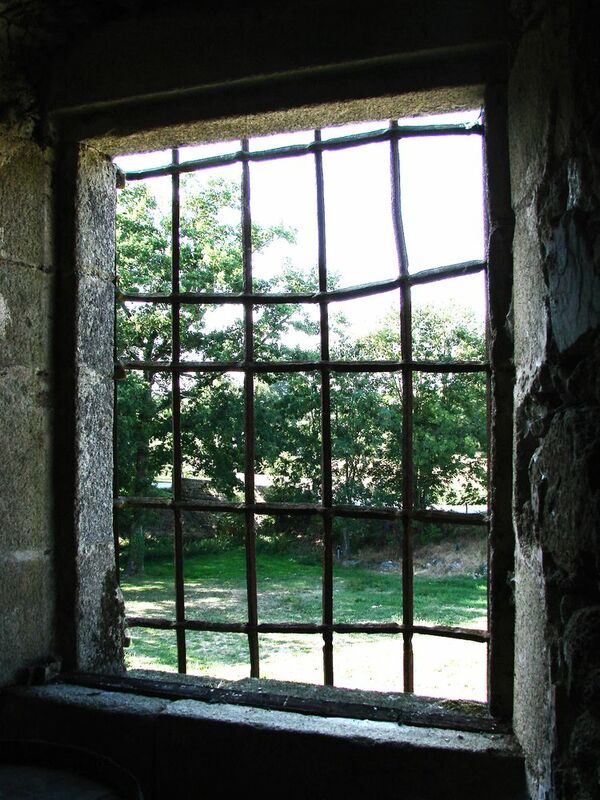 It was presumably accessed by means of a drawbridge with lifting arms, spanning the moat. This disappeared in 1796, in a battle during the War in the Vendée and was restored to service during the 2009 restoration. This door was defended by a portcullis, the groove of which can still be seen and blockhouses on either side of the entranceway. It is a small internal courtyard, formerly paved and open-air. 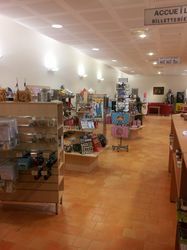 Its purpose was organising distribution and access to the different rooms of the castle. 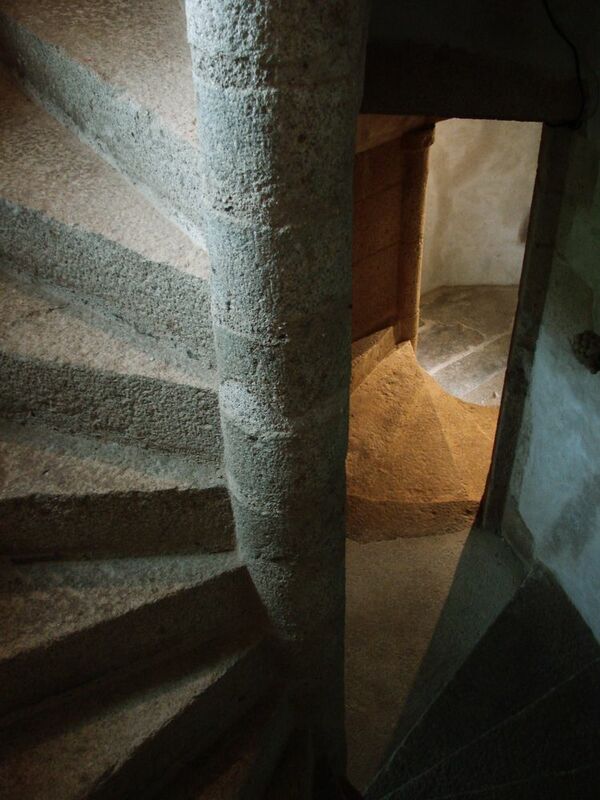 • The floors of the gatehouse via a spiral staircase. 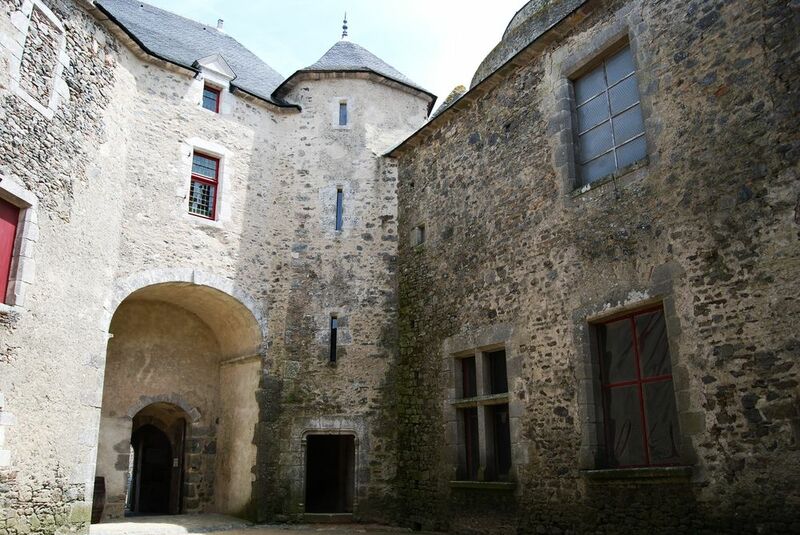 It is a room slightly below the internal courtyard, to the North. Originally, three levels of flooring were superimposed, one on top of the other. The current temporary roof covers the second level. On the ground floor, a 17th century low door is today the only way of accessing the cellar located under the Lord’s private residence to the South. 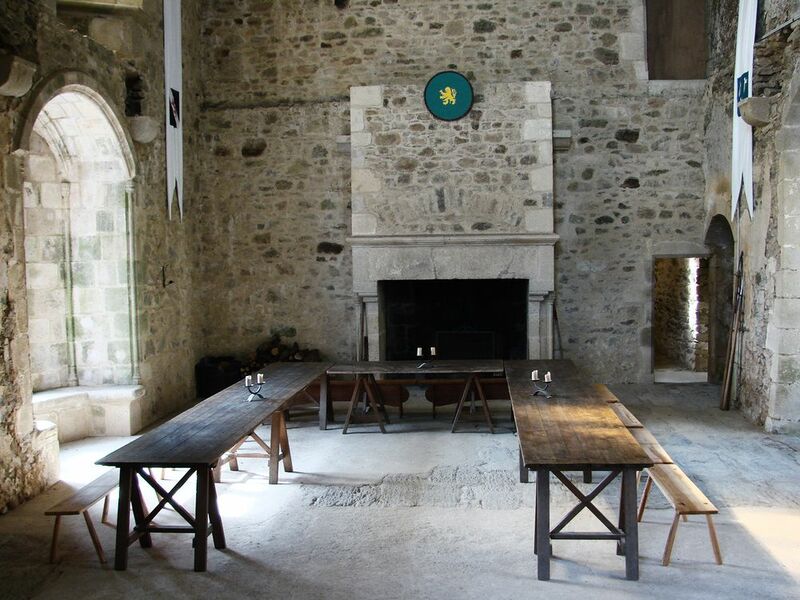 The first floor has a very beautiful 15th century, fireplace, as well as a window with window seats or stone benches. It is a modest kitchen because it was only used for preparing meals. 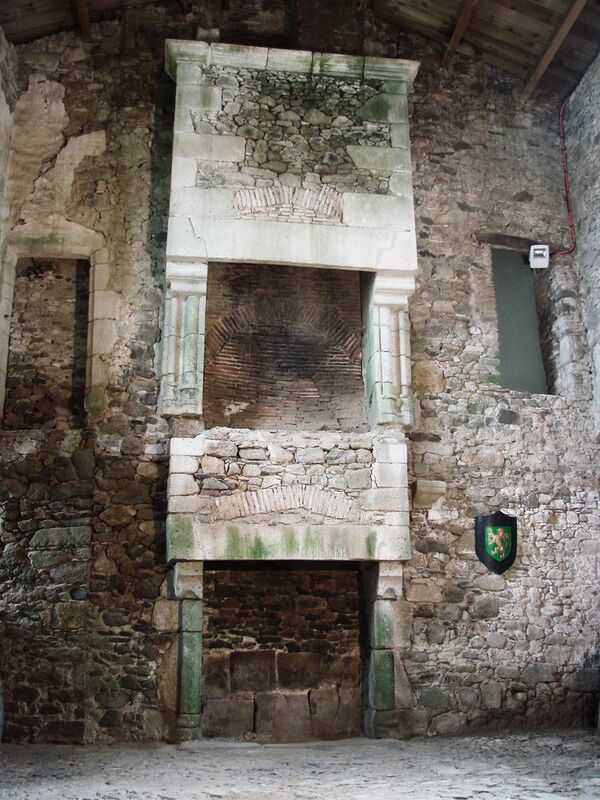 Two granite fireplaces are positioned facing each other. 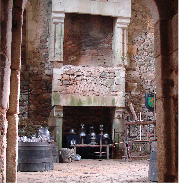 The largest to the South dates from the 15th century and the other, from the 17th century, is recognizable by the opening of the old bread oven. 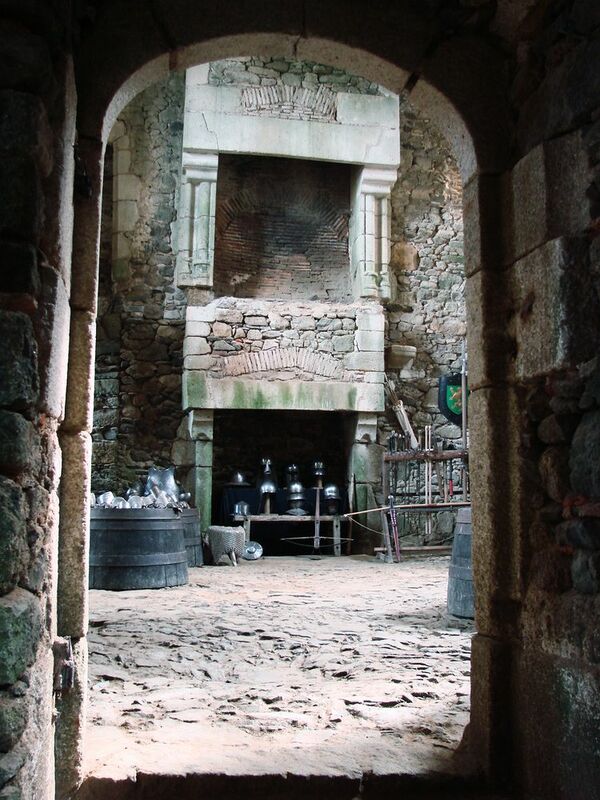 In the window frame, on the moat side, a door, then steps, offer the possibility of going outside the castle: this exit is commonly called the postern. The terracotta tiles and the windows on the courtyard side are reworkings from the 17th century. 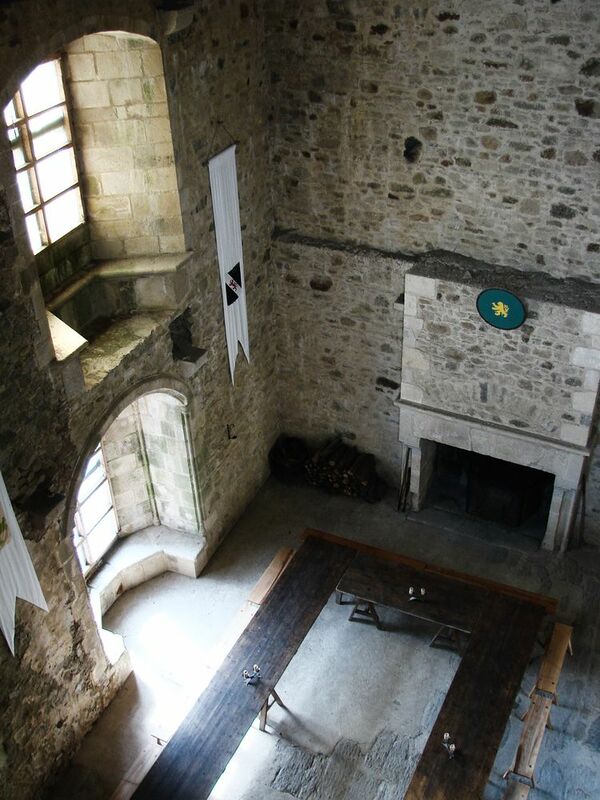 It is the imposing great hall of the castle, rebuilt in the 15th century and used as a state room and court of law. 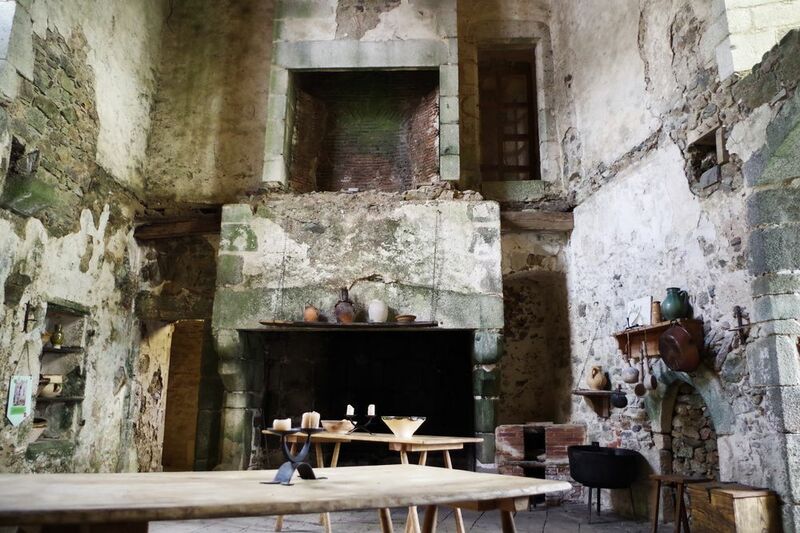 On the ground floor, on the moat side, it is lit by a very beautiful 15th century, the originality of which stems from its semi-circular stone bench or window seat and its subtle decoration comprising of small columns with human heads. 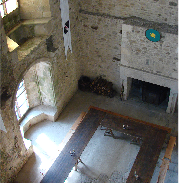 This room was restored in 1997-1998, as it collapsed during a storm in 1983. The floor is still paved, in places, with large stones dating from the 18th century, called “Pierre de Pelochère”, from the name of the quarry in Saint-Pierre-du-Chemin, in the Vendée. 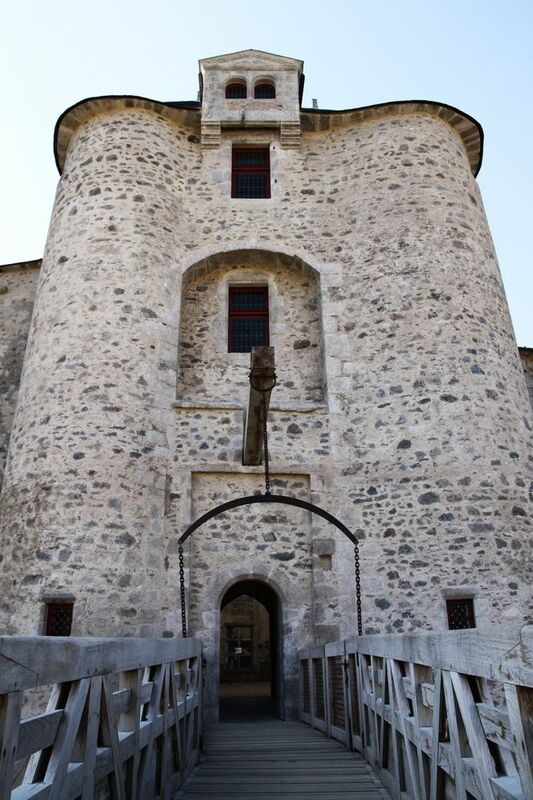 It is the main tower of the castle. 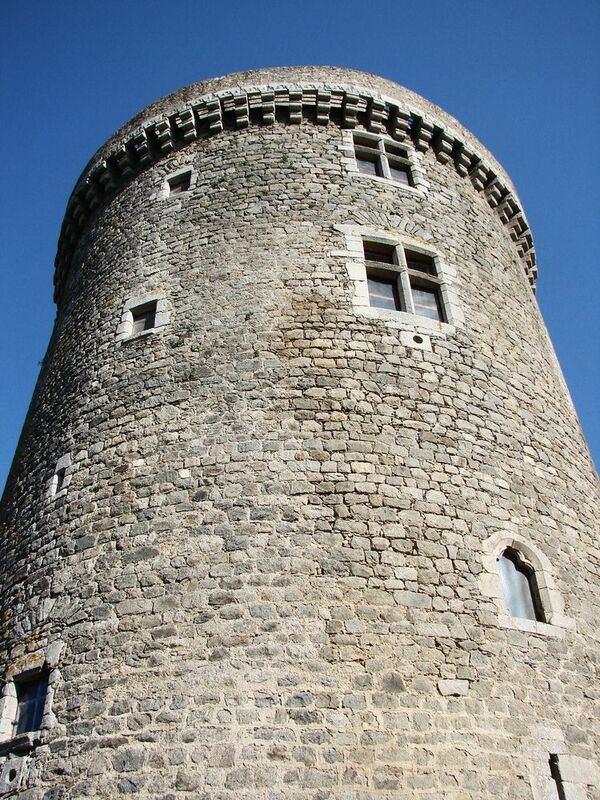 This keep is both defensive and residential. 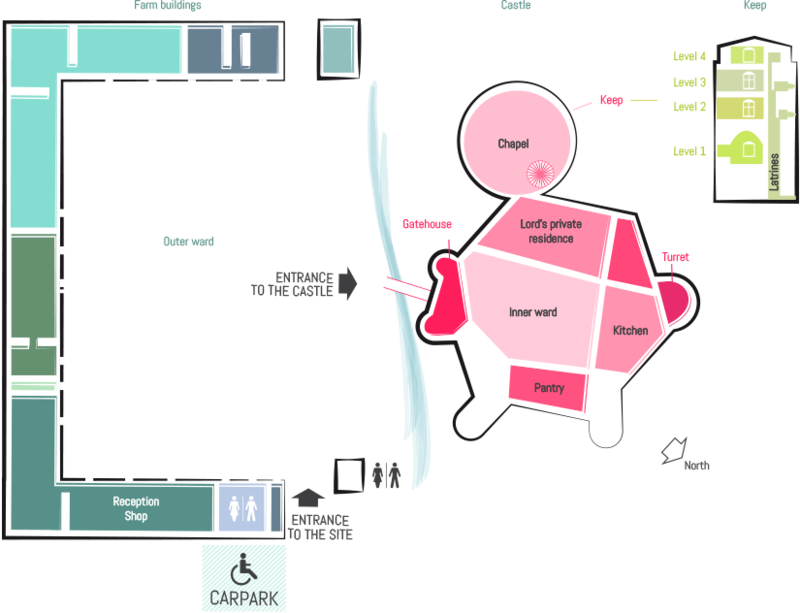 It is made up of 4 levels: a chapel on the ground floor, bedrooms and anterooms on the upper floors and an arms room at the top, all accessible via a large granite spiral staircase. 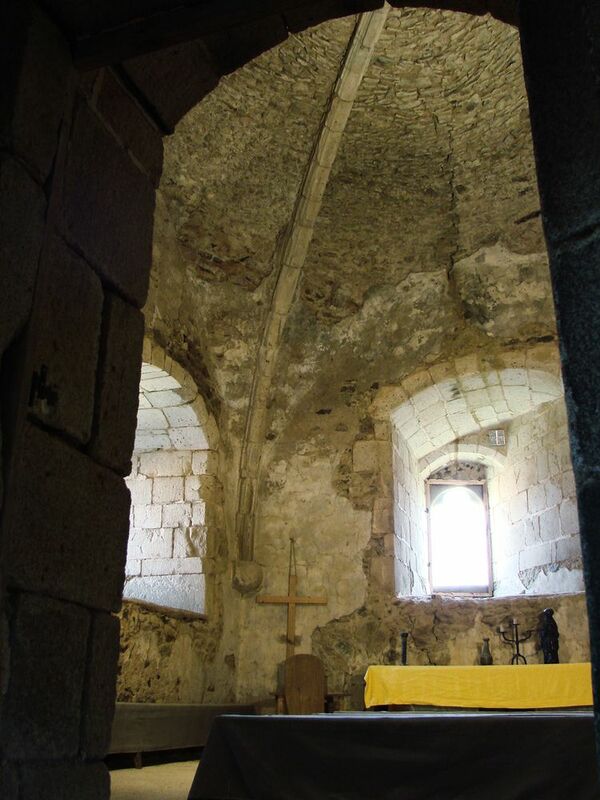 On the ground floor, the only vaulted room of the castle (dome vault) is used as a chapel, in the 17th century a sacristy and liturgical lavabo were added to it. 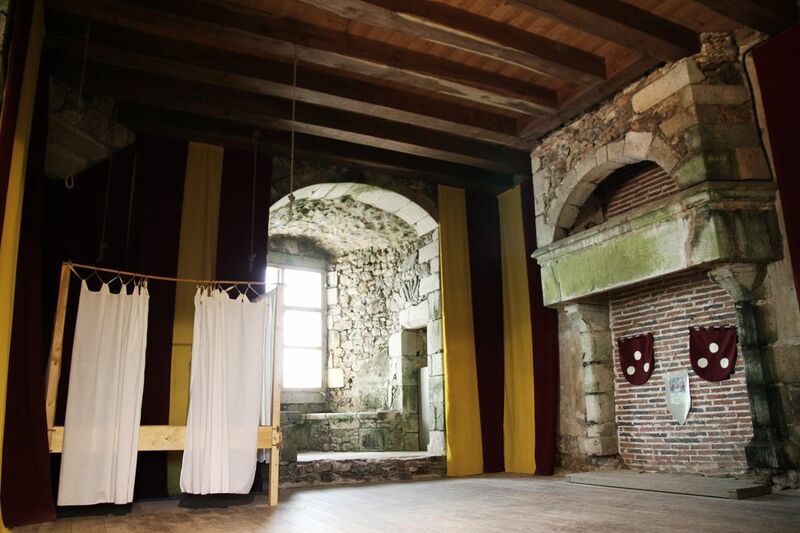 In the 15th century, this room had a military use, hence the three small blockhouses (chambres de tir) below the room. Each blockhouse is, in this way, defended by a loophole and a gun port. Each floor, for private bedroom use, is lit by large windows with mullion and transom, equipped with their window seats. Some are symbolically defended by gun ports. 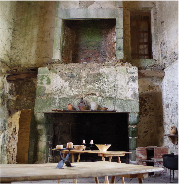 In each adjoining anteroom, there is a fireplace, window and above all, an access door to the latrines. 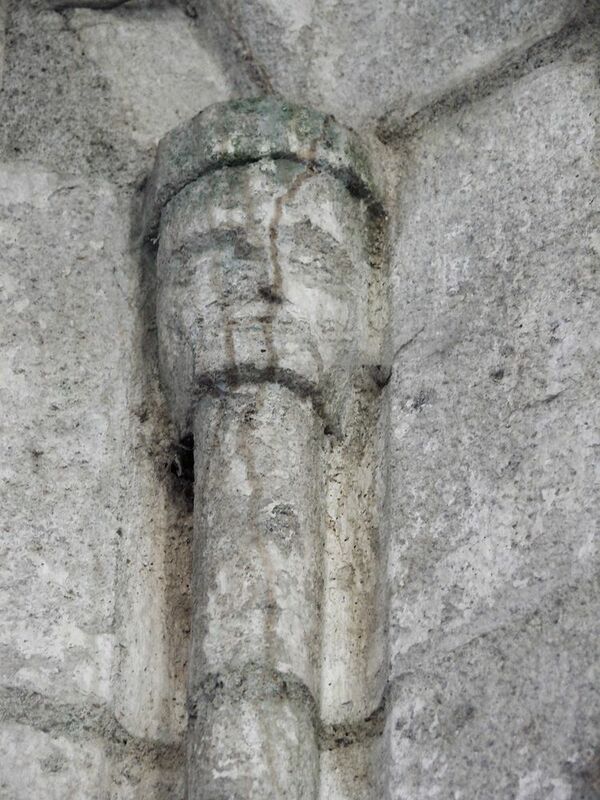 Indeed, a huge waste pipe (2 × 6 m), for the latrines, is incorporated into the thickness of the wall of the keep and serves all of the levels of the tower. A discharge pipe in the moat is visible at the base of the keep. On the top floor is the rampart walk, originally covered. 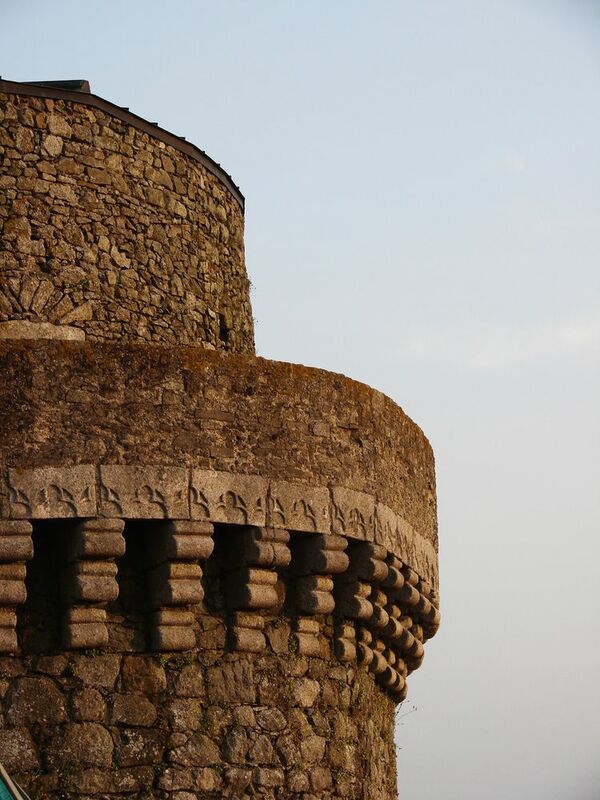 It rests on machicolations and is protected by a stone parapet. The keep, culminating at 28 m high, is today truncated. 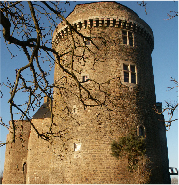 It is missing a watch tower (the watch turret) which should overhang the medieval roof.